Sol 2084, June 17, 2018. The increasing dust in the atmosphere over Gale Crater is darkening and reddening images taken at the surface there. 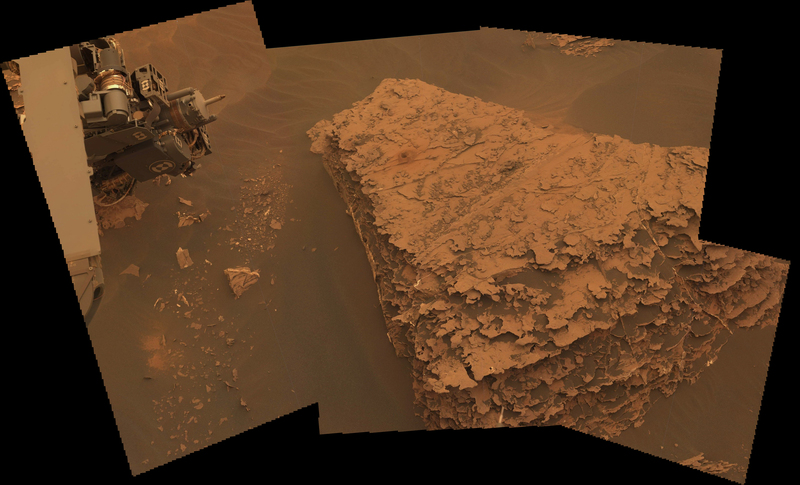 Above is a series of composited Mastcam 34mm frames on the rock named Duluth, which shows the recent drill site with a little mound of tailings around it. Click the image to enlarge it, and note the intricate weathering of the layers and mineral veins. Such delicate features would not survive long on a terrestrial rock. Sol 2084 raw images (from all cameras), and Curiosity’s latest location. This entry was posted in Reports and tagged Aeolis Mons, Curiosity, Duluth, Gale Crater, Mars Science Laboratory, Mount Sharp, MSL, Murray Formation, NASA, Vera Rubin Ridge. Bookmark the permalink.